This is the sixth, and final, in a series of travelogue posts about an Erasmus+ cultural heritage, study trip undertaken by Jackie Sangster from the Learning & Inclusion Team at Historic Environment Scotland. 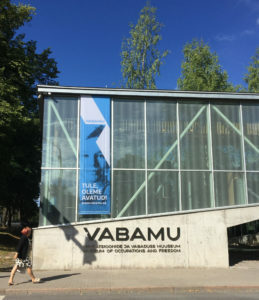 It seemed the time was right, that on our last day we would visit the purpose built Vabamu Museum of Occupations & Freedom. This museum is powerful. I was immersed in the stories from the outset. The interpretation for me was second to none. The use of technology was intuitive and successful. The virtual reality experience of decorating a sparse Soviet apartment was enjoyable. 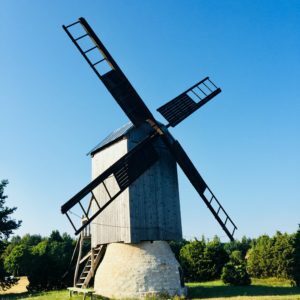 The carefully curated objects and archives reinforced the narrative, all about Estonia’s recent history, making us think about the value of our freedom. The various films with real people relating their personal stories and recollections were the highpoint – genuine, heartfelt, matter-of-fact & authentic. Not surprisingly, the museum touched Maarika most intensely. Personally I know a woman, who as a small child fled, from Estonia to escape the Russian invasion of 1940. She has led an astonishing life. Knowing her, and her family well, made this museum & especially the permanent exhibition, ‘Freedom Without Borders’, resonate for me. I was also able to draw some parallels in my own life. Having grown up during the Troubles in Northern Ireland, I am all too familiar how violence & conflict impacts on life. In fact, afterwards another group member & I were wondering why Belfast did not have such a museum. It saddens me to say, I don’t believe the peace process has reached maturity yet. A leisurely lunch & to our final stop Tallinna Teletorn the TV Tower & some matches. After a tour providing the context of the tower’s history. Construction began in 1975 and it was completed for the 1980 Moscow Summer Olympics and Tallinn was the host city for the sailing events. The 170-metre-high observation platform and landmark opened for the occasion. 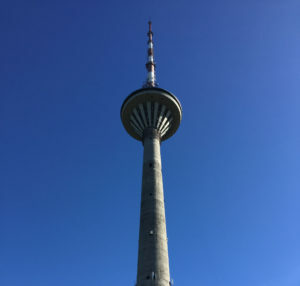 Today TV Tower is one of the most important symbols of the restoration of Estonian independence. In August 1991 radio operators risked their lives to protect the free flow media and declaration of independence. We enjoyed the interpretation of these events in a humorous almost slapstick film, nonetheless enjoyable as an overseas visitor. 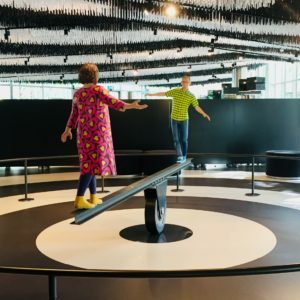 After taking in the 360 degree vistas of the city & surrounds from the viewing platform we descended again to see the temporary exhibition called “No Bananas Today” – Time Travel to Soviet Daily Life. This was another take on the interpretation of Estonia’s recent pasta and a peek behind the Iron Curtain. In 1992 I was lucky enough to spend the summer travelling in Russia, so seeing this exhibition brought many memories back through the little details, especially the reconstructed sets of shops, cafes & homes under Communisim. I devoured each interpretation panel as they were loaded with anecdotes about how people endured the Soviet regime by scrimping, saving, stealing or swindling the system. Life was hard and relentless but this exhibition explored what can be now be considered as absurd. Finally, back to our hotel in the district of Nõmme & for our farewell dinner with Maarika and joined again by Riin at Mimosa to indulge in some contemporary Estonian cuisine. 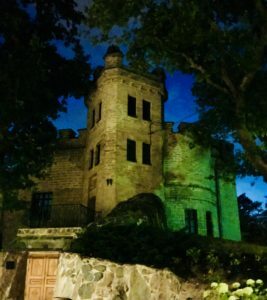 Spontaneously after dinner, our super hosts decided we needed an unscripted, late-night adventure to see the whimsical Glehni Castle or Jälgimäe Manor. So off we went in the dark to find this medieval castle-style building. Created by Baltic-German owner Nikolai von Glehn in 1886. It has a number of curious features, including an organically formed palm house. Nearby are his statues of Estonia’s epic hero Kalevipoeg, known as the ‘devil statue’ and another of a dragon which looks more like a crocodile. Tallinn’s district of Nõmme was founded by Nikolai von Glehn in 1878 as a summerhouse district, now it’s referred to as the forest city suburb. The development started around the railway station. 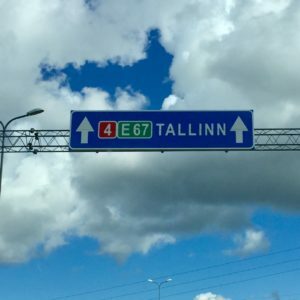 In 1926 it was granted town rights, but in the beginning of the Soviet occupation in 1940, it was unified to Tallinn and remains as one of the eight districts of Tallinn today. As if the day couldn’t get any better Riin also invited us into her Nõmme home, this was such a privilege. It was a Soviet house build in a street for artists. Therefore the design incorporated extra studio space and more windows to allow light to flood in. Riin had bought her home form the original owner-occupiers, both of whom had spent their lives working there. They were elderly when they left and Riin acquired a vast hoard of artwork with the house. Some of which was contributed to The Art Museum of Estonia collections. The studio still contains much of their collection & there are sculptures all over the garden. From what I could see in the dark, the fabric of the house for me was exquisite in its simplistic design and built to last surrounded by the forest, idyllic. Homeward bound & time to leave Estonia. 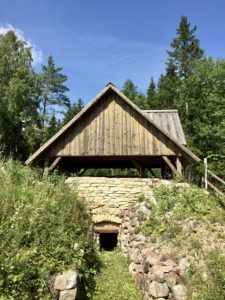 This study trip exceeded expectations with a great group of heritage sector colleagues, I believe we learned more about Estonian cultural heritage than any of us ever expected to. Hopefully this report encapsulates just some of the joy had on this learning journey. As for our host Maarika, Eesti oli imeline – head aega ja tänan teid väga. 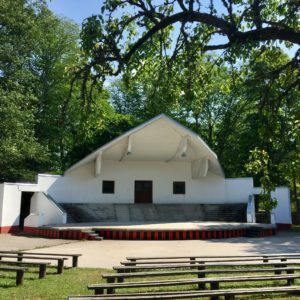 This is a report on a course developed by ARCH, hosted by Maarika Naagel from Viitong Heritage Tours and funded through the Erasmus+ programme. 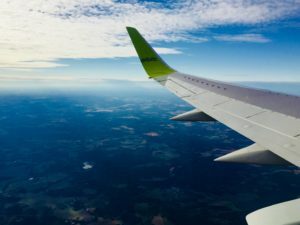 This is fifth in a series of travelogue posts about an Erasmus+ cultural heritage, study trip undertaken by Jackie Sangster from the Learning & Inclusion Team at Historic Environment Scotland. Like Edinburgh, the historic centre of Old Town of Tallinn is a UNESCO world heritage site & upon arrival it was obvious to see why. Here we met Riin Alatalu, for a walking tour of the city, old & new. Riin is an associate professor at the Estonian Academy of Arts and an expert in built heritage, so we were set for an enthralling walk. Our rendezvous point was outside the Soviet built, 1963 modernist Writers’ House at 1 Harju Street. Today, the ground floor is occupied by a brilliant second-hand bookstore, called Raamatukoi. This is one of the most important streets in Tallinn, dating back to early medieval times. Most notably in 1944 the Soviet Union performed air raids here, the heavy bombing of Tallin killed hundreds. The last ruins of old Harju Street served as a memorial but after archaeological work in 2007 a park was created. In 1966, this vicinity was the first conservation area established in the former USSR. We wandered with Riin, hearing about the evolution of the city and its diverse architecture – there was a lot of information to absorb. Within the magnificently preserved Old Town we witnessed the vast hordes of tourists and co-ordinated cruise ship visitors as they too enjoyed the courtyard surroundings of Katariina Kirik. Sadly, the oldest working pharmacy in Europe established in 1422, Raeapteek, was closed – perhaps because it was Sunday? 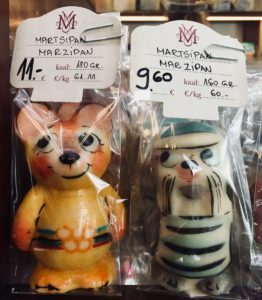 However, we were able to pop into the Kalev Marzipan Museum Room to see the mesmerising, medicinal confectionary figures in the 1864 Café, Maiasmokk on Pikk Street. 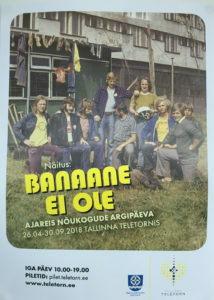 At the Linnamuuseum Tallinn City Museum, housed in a medieval merchant house, we went to the exhibition ‘One Hundred Years of Daily Life’ about everyday life the city and how it has changed – it was great! We also saw the permanent display about the history of the city and I learned about the impact of the Hanseatic League. I have since discovered there were settlements associated with Hanseatic trade in Scotland too, such as Hillswick on Shetland. In the cellar, we explored the glorious stores of ceramics & metal. 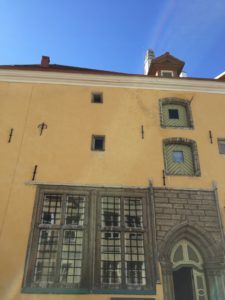 Continuing outdoors, we wove our way around, spotted more Muhu style doors, many Kultuurimälestis National Monuments and wound up towards Alexander Nevsky Cathedral at the very top of the city by Toompea Castle, where the Estonian Parliament sits. From this aspect, we joined the masses taking in great panoramas of the city and the sea. After all that we were ready for our evening meal so we set off to the cool Kalamaja district to dine. Today this is one of well-known areas for its hipsters. Beyond the train station, it boasts Bohemian charm and consists of wooden buildings which once accommodated fishermen. Before our table was ready at trendy Boheem, Riin had more knowledge to impart about the local architecture. 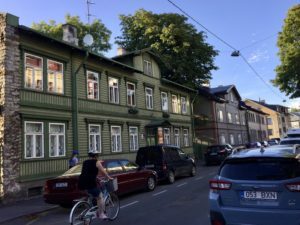 We were surrounded by gorgeous two storied timber tenement houses with symmetrical facades, named after the architect engineer Voldemar Lender who was also the mayor of Tallinn from 1906 to 1913. These early 20th century homes had been cheap to construct when the city had been growing rapidly. 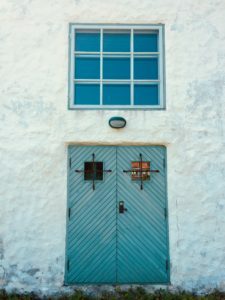 The houses have subtle variations reflecting the owners’ preferences, such as doors with carved details, fanlights or ironwork ornament around the windows. I was captivated by them. Scotland’s fisher town communities, such as those in Cromarty or Dunbar, looked somewhat different at this time. The local building material was stone rather than wood, which resulted more often in lower level thatched cottages. 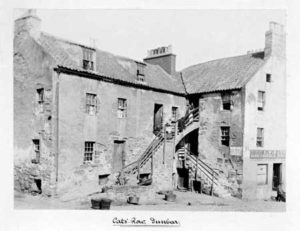 Although, Cat’s Row in Dunbar looks like a larger tenement circa 1900. 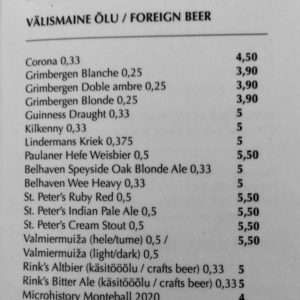 During dinner much to my amusement, a reminder of home unexpectedly surfaced because Belhaven Ale (made in my adopted home town of Dunbar) featured on the foreign beer menu. Later, Riin told us about a travel campaign she’s involved with, that is Visit Baltic Manors. 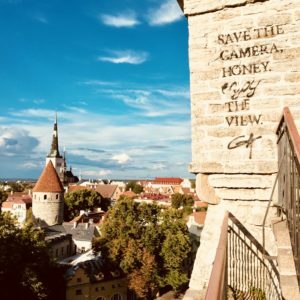 This European Year of Cultural Heritage initiative celebrates 130 historic heritage sites across the Baltic countries; Estonia, Latvia & Lithuania. When given our own traveller’s card, we were pleased to see we’d already been to two! That was Loona mois and Muhu pastoraat. After dinner, we travelled back to our hotel by train to rest up for our penultimate day with Maarika. This is fourth in a series of travelogue posts about an Erasmus+ cultural heritage, study trip undertaken by Jackie Sangster from the Learning & Inclusion Team at Historic Environment Scotland. Moving on from our base today, we packed-up and left for our engagement with the director of Saaremaa Muuseum, housed at Kuressaare Castle. At first glance this citadel, complete with moat, looks like the stuff of fairy tales and unsurprisingly it is a Kultuurimälestis National Monument. 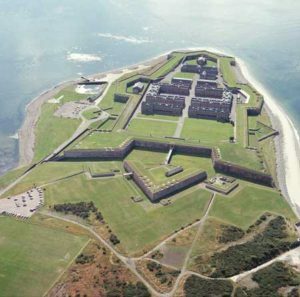 Viewed from above, the aerial plan is reminiscent of our own 1769, HES property in care, Fort George. Rita Valge, the director greeted us and we enjoyed a whirlwind Castle tour and explored the collections held within. Rita who is relatively recent in post expressed the challenges she faces in her quest to update some exhibition interpretation. Yes, it was apparent that certain collections would benefit from a more contemporary curation and display solutions. 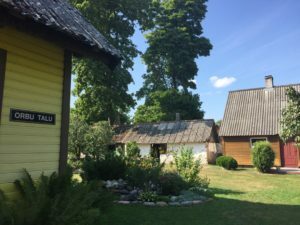 Yes, there were some dated mannequins and cabinets not fit for purpose, however the exhibits had charm and offered intriguing insights into Saaremaa’s history. There was general discussion within our group about bespoke souvenirs, visitor flow, access issues, promotion … as I have worked closely with digitised archives & collections on scran.ac.uk for ten years, my query was about accessing to the museum collections online. I was also curious to know if Rita was aware of any Scottish objects held within the museum, she was unsure. 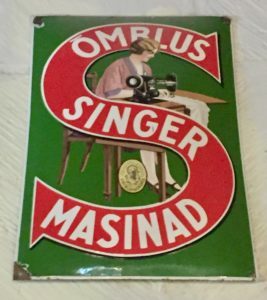 Later, amongst the collections on exhibition, I was delighted to discover that Scottish connection I was seeking and it came in the form of an enamelled – “Singer Õmblus Masinad” a Singer sewing machine sign! 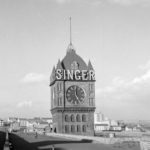 The household name & sewing machine manufacturers, Singer transferred their factory works from Bridgeton to Clydebank during the 1880s to become the largest sewing-machine factory in the world! To Scots, Singer is synonymous with this Glasgow works. My favourite part of the morning was the permanent exhibition of contemporary history from 1950-1994 designed by artist Vello Laanemaa. 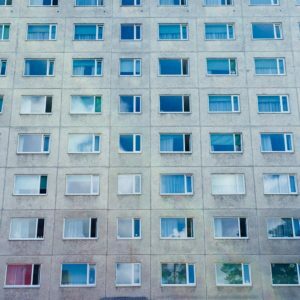 This led the viewer chronologically, up through seven spaces and the various decades of Soviet occupation & Estonian social history. Each flight of stairs connecting the floors contained amusing jokes within the steps, a nice touch. The carefully selected objects succinctly told the stories and struggles of daily life. Time was up at the castle & so to Kaali for lunch. Our reason for going to Kaali was to see the noteworthy punch-bowl crater formed there by a meteorite 4,000 years ago and of course to find out about how the heritage is handled – how the community has turned potential interest into practical solutions. There were tales of associated folklore surrounding the site, scientific & archaeological aspects to the crater field and so on. As we made our way back from the site to the purpose-built tourist centre, we were lured by signs of local lace on sale in the school building. There was a wealth of crafts on offer to the international visitors here. 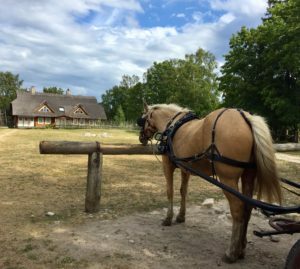 Crossing the Väinatamm causeway, we left Saaremaa behind and proceeded to its smaller sister, island of Muhu to see some stunning horses at Tihuse Horseriding Farm. The heritage trails at this horse breeding farm were based on various Forest Father stories & memories of the owner’s grandparents. We had the absolute pleasure of jaunting around the forest in two wagons, however for me the well-meaning delivery of the heritage aspect was a little thin & unconvincing. The owner, Ahto Kaasik was supposed to meet us, however he was unable to. 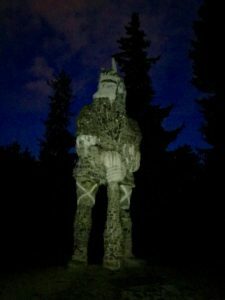 The staff were excellent equestrians, committed to their animals but it was unfair to have them deliver some of the folklore based activities – perhaps the intended Pagan spirituality was wasted on me. The environmental interpretation back at the café didn’t quite convince me either sadly. More positively though, we all fell in love with the five-month old foal. Our day was still young and we were expected at another Kultuurimälestis National Monument, i.e. Muhu Pastoraadi, now Muhu Heritage School stands beside Muhu Katariina Kogudus (or St. Catherine’s Church), in Liiva. We were met by former pupil Kadri Tüür (with babe in arms), she is the powerhouse behind this conservation project. Funding has been secured from the EU LEADER programme for rural development, to partially restore this 1832 building and we were privileged to have a behind the scenes tour of this historic parsonage. Kadri sought out our ideas how to interpret and revive the building, to usher in its next chapter. Given the traditional methods required and materials such as lime being employed in the fabric of the building, I saw potential links with the work of Scotland’s built heritage conservation centre, The Engine Shed. Interestingly, when asked if the lime being applied was Lubi Ò , it transpired it was not but another brand from another part of Estonia, Savikumaja. Leaving, we stopped to admire the unmissable Muhu Ingel sculpture, another project by Kadri Tüür – another inspirational Estonian woman who has written a book “The Muhu Angels” stories about Muhu women, heard in the family home. 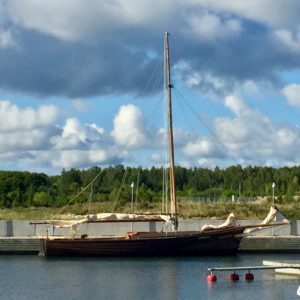 There was now a little time to stop for supplies, namely the much loved Muhu Leib – a locally produced black bread, before our adventures on the high seas. 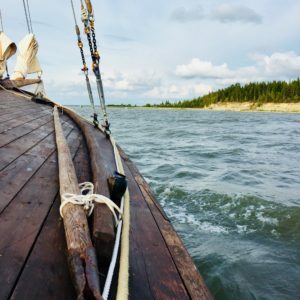 We set off from Kuivastu harbour on a historic uisk sailing ship called ‘Moonland’. In 2009 Väinamere Uisk was founded to re-build this traditional wooden vessel. The captain of our ship told us about the origins of uisk which were still in use until the early 20th century. During the Middle Ages people from the Saaremaa & Muhu islands were called vikings and their vessels were named huisk or snake. So, these narrow and relatively light weight vessels became known as serpent ships. It was a breath-taking voyage as the sun set we admired the cliffs on the island of Kesse in the Väinameri Strait. 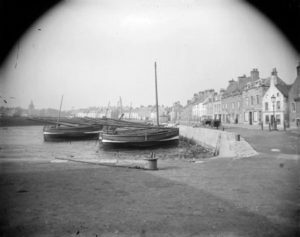 Back at the office, I was taken by the similarities of the ships in this photograph, taken of the harbour at Anstruther, Fife in the early 20th century. Apparently sailing ships used Anstruther as a port for sailing to the Baltic – could that be a serpent ship? When we returned to land our home for the night was at the nearby Kuivastujaani, our second tourist farm stay. Before leaving the next morning to catch the ferry, we were invited to look around at the owner’s beautiful striped doors. 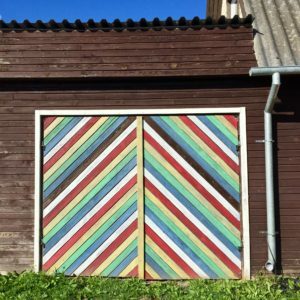 The ancient tradition of painting doors and decorating them has been revived in Muhu. We would start to see them everywhere. 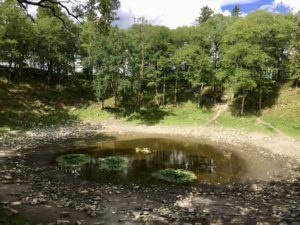 This is third in a series of travelogue posts about an Erasmus+ cultural heritage, study trip undertaken by Jackie Sangster from the Learning & Inclusion Team at Historic Environment Scotland. Today’s start was not for the faint hearted. There was more culinary heritage to explore and fish was on the menu for the evening – we were to prepare it from scratch. I can’t say I was looking forward to the experience when faced with a bucket of freshly caught flounders, however it had to be done. Led by Aado Haandi at Värava, we were skilfully taught how to gut & prepare these bottom-feeding, flat-fish correctly. 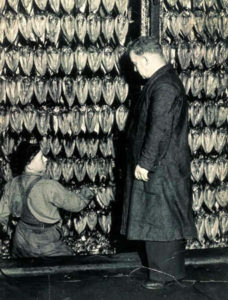 Once cleaned and salted, they were hung to dry before being smoked later in the day. Ready for adventure after a short drive north west, we set off on our nature hike to the Hariland Peninsula located at the tip of Tagamõisa peninsula once again within Vilsandi National Park. On our way, I asked to stop at a spot which caught my eye in Kõruse. 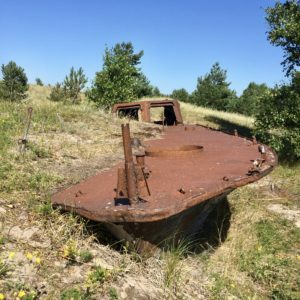 The place could be described as a ghost town, the inhabitants were evicted by the Russians in 1945 to make way for an army base, a Soviet border out-post. The place was littered with the remnants of military occupation; a crumbling checkpoint, rusty signs, a faded noticeboard, a monument which was out of bounds and lots of Marston matting. 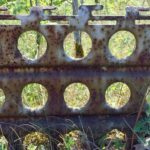 Here this perforated steel planking, often used as portable runways on soft ground for temporary airstrips in WWII, had been repurposed as a small fence. The place really intrigued me and later in the day we also encountered a stranded boat embedded in dune and a distant line of anti-tank blocks in a field, all linked to the military defences of the past. If you know where to look in Scotland, it’s also easy to encounter anti tank defences. We parked up at the end of the current road, at Harilaiu from here on it was on foot for us. The road once went all the way to the end, past the Kelba Spit, to the captivating Kiipsaare Lighthouse. However, nature has fought back and the Soviet road has long since been consumed by the sea. Kiipsaare Tuletorn was originally built of concrete in 1933 to warn seafarers of the dangers of the Baltic Sea. 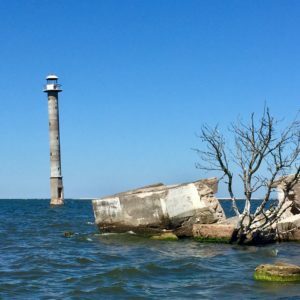 It once stood on land, but erosion has taken its toll and now the tower stands askew in the water. 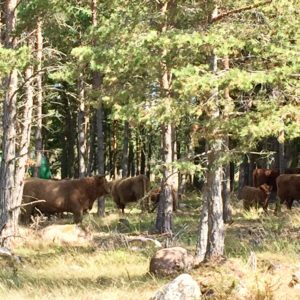 The walk allowed us to witness the huge diversity of plant & animal life thriving under the care of the Riigimetsa Majandamise Keskus (State Forest Management Company). On site the RMK promote positive engagement with the landscape through a series of informative interpretation boards and basic facilities such as composting toilets. The rangers amongst us were in their element, observing birdlife & butterflies all around. To my lay person’s eye, I would have said the environment was close to pristine, the only unfortunate sight was really rather peculiar. 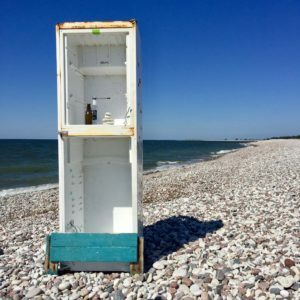 Initially the group was unsure what we were looking at in the distance on the beach, it did not become apparent until we were closer that there was a fridge standing on the foreshore. A reminder that marine waste infiltrates every environment. After our invigorating circular hike, it was back to finish of the fish preparations at base. 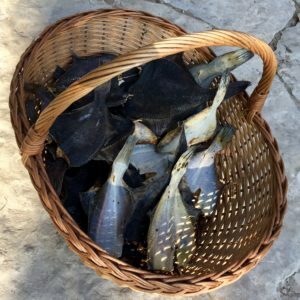 The fish which had dried since morning, were now ready to be threaded onto long skewers & hung in the already lit, wood-smoker in the trees. 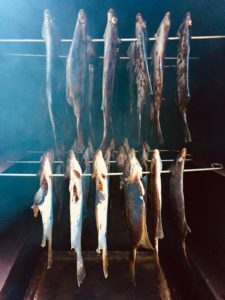 We wondered how they would compare to the more familiar smoked fish found at home such as the Kipper or the Arbroath Smokie? Meanwhile Maarika had arranged for a local teacher, Paul to deliver an open-air, wood-working session, so we were thrown into creating a variety of artefacts. Despite our language barriers Paul gave us a highly skilled lesson on the steps required, using a variety of manual & power tools. I chose to make a trivet from juniper wood, which I enjoyed making immensely. The scent of the omni-present juniper wood will always remind me of this experience. We also bound together a selection of branches including birch twigs, oak and more juniper to make viht AKA whisks, or whips, for use in the sauna planned for later. After eating our fishy tea, the genuine sauna that evening was a wonderful way to end the day. Of course, there were ancient saunas in Scotland too, let us not forget the sauna at the Brough of Birsay settlement on Orkney, granted this was no doubt introduced by the Norse men. We were recharged by the sauna & more good sleep was had, ready for another day in the field with Maarika. This is the second in a series of travelogue posts about an Erasmus+ cultural heritage, study trip undertaken by Jackie Sangster from the Learning & Inclusion Team at Historic Environment Scotland. 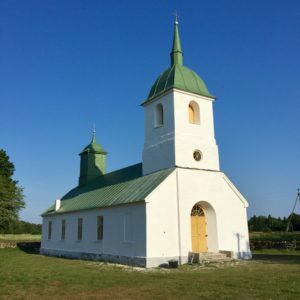 We set off early to see this peninsula, sometimes travelling on dusty unpaved roads to the southernmost section of Saaremaa. Along the way, we viewed the raised Kaugatuma cliffs. The previously wooded landscape gave way to a some more open, exposed terrain with thin soils. 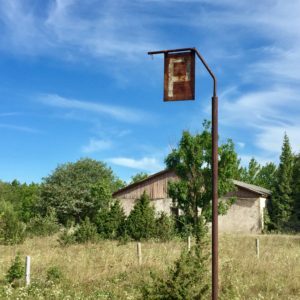 Although it seems remote today, pre-war this area was the most densely populated, rural area in Estonia. Our first port of call was another family initiative, the Sõrve Wool Factory. The Sepp family run a business making use of home-grown fleece from herds of sheep, some goats and even a couple of dogs! 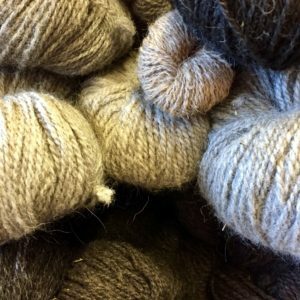 The wool factory is a cottage industry with industrial carders in-situ to prepare the raw wool prior to spinning, weaving, knitting and so on. Nothing goes to waste here, as we also had a nibble on some tasty home-made cheese. It was time to get hands on, with the choice of weaving or metal work. Having dabbled in weaving in the past, I opted to join Egon outside for the metal workshop under a tar-soaked tarpaulin. It was explained that the area had considerable military significance in various C20th conflicts. During World War II it saw major battles between Soviet and German forces. As a result, the forests are still littered with ordnance remains, so it can be dangerous to walk in the woods. However, we were to be using the metal salvaged from a collected shell casing, to create a piece of jewellery. So, after the demo, we set about measuring, cutting, heating, embossing and shaping a ring each, ending up with a unique memento. Not a form of upcycling I’d encountered before. Thinking more pop-culture that cultural heritage for a moment, Egon Sepp also happens to be the proud father of the recent winner of Eesti Otsib Superstaari 2018 – Uudo Sepp is Estonian’s latest “Pop Idol”. 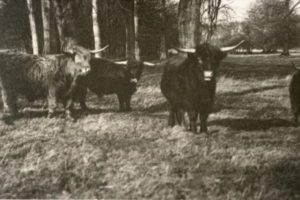 Music is part of Sepp family life, so before leaving we appreciated some folk singing from Maarika & Merika Sepp and were introduced to their herd of Highland cross cattle who sheltering amongst the trees for shade – another Scottish connection. 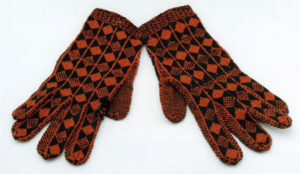 The Sepp family also produced knitted garments from their home spun wool, using Estonian patterns. 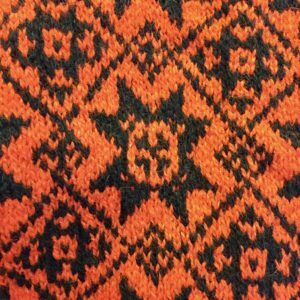 The intricate patterns are not entirely removed from the traditional patterns we associate with the northern isles of Scotland, Orkney & Shetland, where of course there are strong Scandinavian connections. Comparisons could also be drawn with Sanquhar gloves. 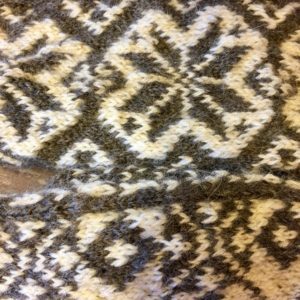 Scotland has a longstanding relationship with crofting sheep, wool production, fleece, fibre and felt products. And then to Anseküla south of Salme, to meet Mari Lepik for lunch at Anseküla Teelistemaja, another former schoolhouse re-purposed in recent years. 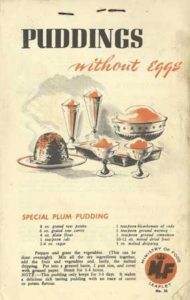 It serves dishes based on old recipes, many from a 1900 cookbook. Mari Lepik is nothing short of remarkable; not only is she a mother of five, holds a PhD but also launched an ABC book of local dialect & lifestyle in late 2017 – this promptly sold out by Christmas of that year & it is now in its second print run. She spoke to us all about the research for the publication and her active work to keeping Saareema heritage alive. Through her activities, she aims to engage children and young people with their past traditions. We walked about the village, past the lighthouse to a ruined church. Being unfamiliar with the place, it seemed odd to have a lighthouse in the forest, but we were informed the sea was only a few hundred metres away as we were at the narrowest point of the Sõrve peninsula. By the church was a memorial stone to Martin Georg Emil Körber, Mari informed us about the significance of this C19th pastor and his legacy of songbooks and his influence on proud tradition of choir singing in Estonia. Then, we were caught up and joining in local songs, dances & children’s games with Mari and her two daughters. Mari had brought along her research into local traditional costume, which I found intriguing and examples of homemade garments too. We also met her youngest baby son, who she dresses in hand-sewn, traditional shirt dresses – she is undoubtedly passionate about & embraces her heritage in every possible way. 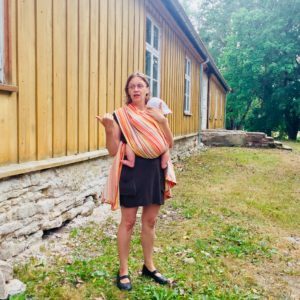 She has the conviction of wearing a heritage headscarf when it may be regarded by many Estonians as old-fashioned or a backward-looking statement. It could be said this was a retro look however, I think Mari’s appearance is more than a fleeting trend. This immersion into Mari Lepik’s life wasn’t over yet though, we were warmly welcomed into her mother’s home for a cooking class. 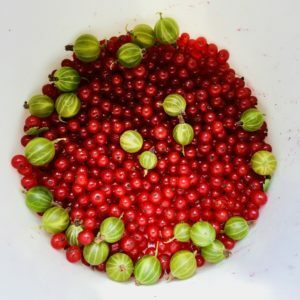 At the family home, we all joined in picking a selection of redcurrants, raspberries & gooseberries which were boiled with sugar, cooled to a jam & then whipped-up with semolina to create the yummy Roosamanna ehk mannavaht or semolina mousse served with cold milk. 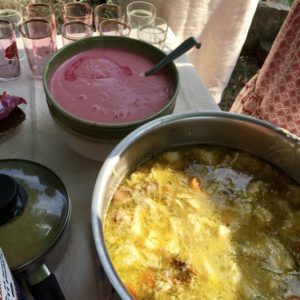 Under the direction of the Lepik women, we also dug potatoes, chopped vegetables from the garden and crafted dumplings for a satisfying soup. 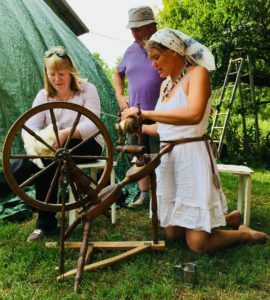 Some of the group tried their hand at spinning wool, others leant against the haystack and joined in more traditional songs. After our communal dinner, we bid our farewells to the family and a menagerie of cats. On our way back to base, we passed the Salme Viking ship burial place. Just another epic day in Estonia. 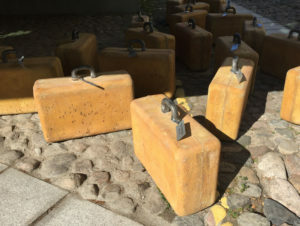 This is the first in a series of travelogue posts about an Erasmus+ cultural heritage, study trip undertaken by Jackie Sangster from the Learning & Inclusion Team at Historic Environment Scotland. Day 1 Travelling to Tallinn & Beyond. 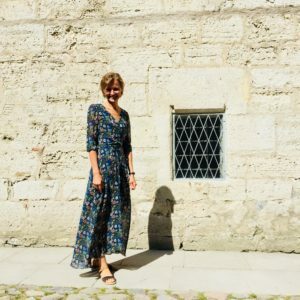 After an early start departing from Glasgow, via Amsterdam our group of eight, eager Erasmus+ participants arrived in Tallinn to be warmly welcomed by the marvellous Maarika Naagel – who we discovered as the week progressed is a font of knowledge & a powerhouse of enthusiasm for all things Estonian. She chauffeured us, via Virtsu harbour and a ferry crossing, all the way to Värava Farm. 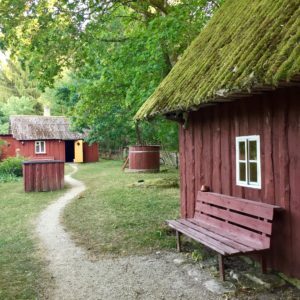 We were to reside here at Selgase Village, in Saare County in the western part of Saaremaa Island in rustic fashion for the next four nights. Day 2 Visiting Vilsandi. Our group had a good sleep as promised on the extensive itinerary for the week – therefore we were prepared for the adventures of the day. We drove to the nearby village of Kihelkonna, where our host also happens to live, to collect our next mode of transport, the bicycle. Off we set to explore the locality in the 30°C heat, no mean feat for a bunch of Scots. En route we passed by Rootsiküla and Kiirassaare. Specifically, we were making our first visit to Vilsandi National Park to meet with the RMK (Riigimetsa Majandamise Keskus or State Forest Management Centre) Maris Sepp and the junior rangers at Loona Manor. Here we heard from two remarkable young people, Karl & Martyn, about their research, achievements and experiences with the natural heritage of the park. I learned a lot about bat maternity colonies amongst other things and remain impressed by the high quality of their presentations, delivered in flawless English. Incidentally, the park came about thanks to Artur Toom a lighthouse keeper who formed the Vailka Birds Reserve in 1901 & the national park was established in 1993 to protect the nature & cultural heritage of the coastal landscapes on Western Estonian islands. 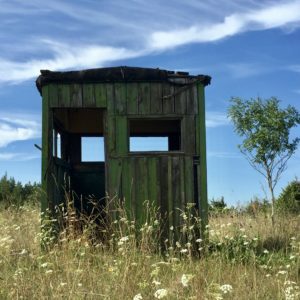 Whilst cycling to & from Loona Park it was plain to see the rich diversity of species surrounding us and the sheer beauty of this corner of Estonia. The landscape, steeped in forest, was also much flatter than anticipated, which aided our progress. This visit was of particular interest to the rangers in our party, whose primary concern was natural heritage. 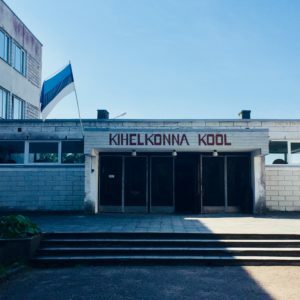 Upon return to the village, we lunched at Kihelkonna Kool and thoroughly enjoyed our school dinner and a first taste of Sinep Põltsamaa! As a former school teacher I was fascinated to be inside this Soviet built school, observing the details of its architecture & interiors. We wandered around the village looking at the mix of buildings, including vernacular wooden homes, the towering lime-washed St.Michael’s church, the old bell tower and the singing grounds/bandstand. Needless to say, the traditional swing was fun too. 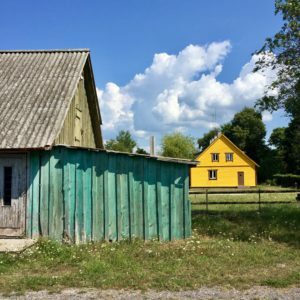 The stark contrast between the traditional Estonian and Soviet era buildings was becoming apparent, even in this small rural settlement. Next stop, not too far away by Mõisaküla was the Lime & Tar Distilling Park based in a beautifully restored former Moravian church. Resident land expert, Pritt Pannou explained & demonstrated the traditional production techniques employed to create lime from the local limestone quarries. Saaremaa’s geology is predominantly limestone. The lime slaking process demonstration instantly reminded me of the many plaster moulds I once made when studying ceramics at university. However, I now have a much fuller appreciation of how lime is created. We learned how to use lime and lime products for renovation and building repairs. 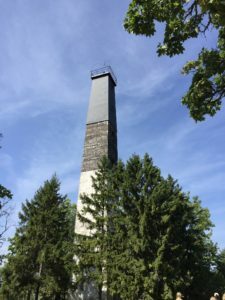 During our walk about the park we saw a series of long-established lime and tar kilns in varying scales and states of repair, all fuelled by wood. 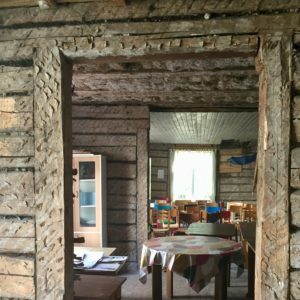 As well as being a centre for learning they are a commercial concern, producing ‘Lubjapasta Saaremaa’ Lubi Ò. Later the same day, we were to see a church which had been freshly painted with Lubi lime & and it shone. Of course, there is a lime producing heritage in Scotland too, with place names often reflecting this past industry. 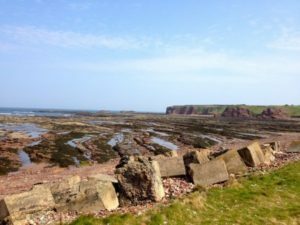 For example, the existence Charlestown, near the village of Limekilns, in Fife is due to a massive seam of limestone running east/west along the North of the village. Over 11 million tons were quarried here over 200 years. 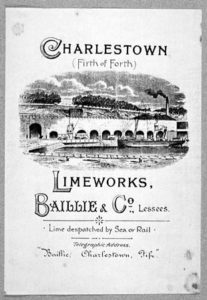 It was processed and distributed over much of Scotland and the works in their day were the largest lime producing complex in Europe. 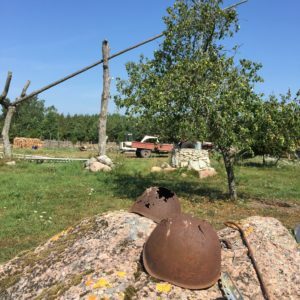 Leedri, Estonian village of the year 2015, was to be the location of our next appointment at Orbu farm to find out about the slow food production of Saaremaa Kadakasiirup or juniper syrup in the new Kadakakoda facility. This artisan production set up by three sisters began in 2011, in the maternal family kitchen on a domestic scale. Today it has grown into an entrepreneurial success story with the support of EU funding. Again, the basis of the business initiative was taken from local raw materials, in this case the juniper bushes and trees found growing commonplace on the island with its chalky soils. Innovation coming from the natural environment. Juniper is a native conifer in Scotland too, although not so prevalent. The adjacent family home, Orbu, also offered fascinating insights into the local heritage. Despite an influx of wasps, the group were able sample the produce, which was testament to its success – just delicious. Like satisfied humming birds, we then enjoyed a walking tour of Leedri guided by the mayor namely Maret, a multi-tasking woman. The community has a variety of popular events which take place in the stunning village house or barn. Most recently, a celebration of midsummer which sounded like quite a party. The fabric of the village is well-preserved with a historical road network lined with dry-stone walls surrounded by green fields. 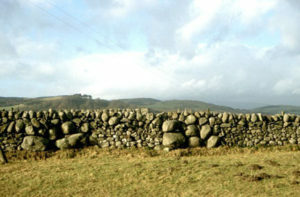 The dry-stone walls, or stane-dykes, were tall enough to provide privacy in this close-knit community & similar of those found at home too – such as those in Hirta on St.Kilda. It was thought-provoking to hear about the removal of villagers who were sent to Siberia following WW2, empty farm plots remain as witness to those who did not return. The tour concluded at the restored, fully functional windmill, a listed cultural monument which appears whimsical. Sadly, what remains of Scotland’s windmills is not so well preserved as you can see via Canmore. 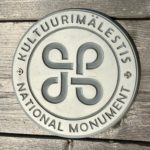 This was the first time I noticed the Kultuurimälestis National Monument sign on a building, however I would soon encounter more. Under the Heritage Conservation Act this designation of cultural monument is given to an object of cultural heritage of historical, scientific, artistic, architectural, religious or other cultural value, which is considered necessary to be preserved for future generations. We bid our farewells to Leedri & off to Lümanda for our supper. Lümanda Söögimaja or tavern, is a popular authentic restaurant in an old church school, offering what I would describe as Saaremaa comfort food. So, we enjoyed mountains of mashed potatoes with a traditional meat sauce – we did not go hungry. After just one day, I think we all realised that Estonian hospitality is hearty. In the evening, as an extra-curricular option we had the opportunity to attend a performance Kuressaare Chamber Music Festival. Four of us opted to join Maarika in listening to the mandolin quartet, Quatuor à Plectres de France France. The performance was enhanced further by its atmospheric location, in the refectory of Kuressaare Castle. “Butter Bar Biscuits are really delightful – Try Them!” Perhaps an unsubtle advertising slogan by today’s standards, but no doubt a success for the Macfarlane Lang & Co Biscuit Factory in Glasgow. Beginning its life as a bread bakery as far back as the year 1817 in the Gallowgate by Mr James Lang, the premises then consisted of a small shop with bakery attached. Soon after the joining of Mr John Macfarlane, in 1860 the company found the need to move into larger premises in Calton. It was here that Macfarlane was joined by his two sons and it was soon decided to erect premises specially adapted to the trade. Opened in 1880, the large factory ensured the continuing prosperity of the firm. It was in 1885, that they decided to manufacture of biscuits as well. 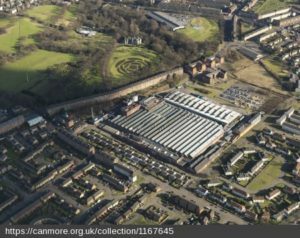 At its extent, the Victoria Bread & Biscuit Works complex at 30 Wesleyan Street, Bridgeton, Glasgow covered an area of seven thousand square yards. A five-storeyed building plus attic block was built in 1895 to designs by J M Monro, architect. The bread and cake part of the business continued to operate on this site, and by 1967 was owned by the Milanda Bread Co Ltd. That bakery operated until 1974, but has since been demolished. 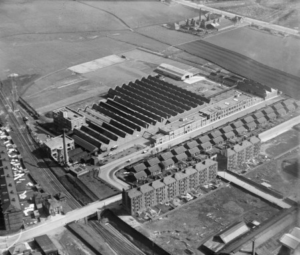 Meanwhile the Victoria Biscuit Works (Macfarlane Lang & Co Biscuit Factory) at 35 Clydeford Drive, Tollcross, Glasgow was built in the 1920s, to replace their first factory. This one was laid out horizontally rather than vertically, very much in the style of the era. Behind a rather plain façade was a large area of workshops, housing bakery and finishing facilities. When the works was built the packing was all done manually. Amongst others, this is where the production of Rich Tea, Gypsy Cream and Cream cracker biscuits took place – ready for dispatch to all parts of the world. 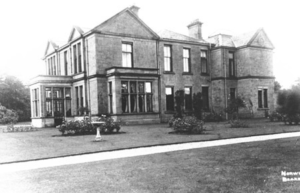 At the same time, owner John W. Macfarlane, purchased Villa ‘Norwood’ in 1920s Bearsden. The Biscuit business must have been booming. In 1948 Macfarlane Lang & Co merged with McVitie & Price. 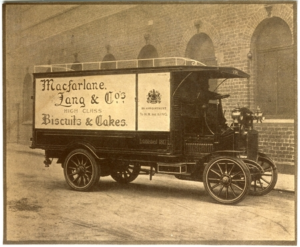 Macfarlane Lang & Co were the largest of the Glasgow biscuit bakers. They were, by 1967, part of the United Biscuits group, an amalgamation of several firms put together by Canadian entrepreneur Gary Weston. The brand name has not survived. 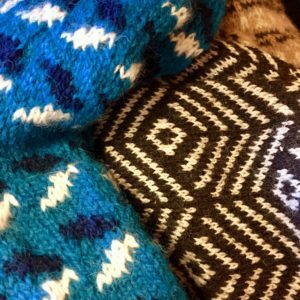 Guest blog by Sarah Longfield, all about our new project. Our partnership project led by See Think Make CIC & Scran part of Historic Environment Scotland, will take place during Year of Young People, 2018. Arts Award is a series of qualifications for children and young people accredited by Trinity College London. Heritage is very much seen as part of the arts world and young people can focus on any traditional craft or more broadly heritage based creative roles, such as curating as part of their Arts Award Portfolio. To date, there have not been many heritage organisations in Scotland taking up Arts Award. However, at the Museum Association Conference at the SEC last Autumn, we were blown away by the amount of interest in the awards and by the open friendliness of all the creative learning professionals we encountered. So, we decided the best way to promote Arts Award’s potential in the heritage sector was to put our money where our mouth is and go out there and deliver a fabulous project. We found Jackie at Scran who was enthusiastic about working in collaboration and also hooked up with Fiona from Scotland’s Urban Past. From there we talked with lots of partners in Stirling, including The Stirling Smith Museum & Art Gallery, The Engine Shed, St.Modan’s High School, Stirling Castle, Forth Valley College, Culture Stirling and the project started to take shape. At the beginning of this month, we heard we had got a grant from Heritage Lottery’s Young Roots fund so we’re now getting ready to launch! To start with, a group of around fifteen 15-25 year olds will come together to use the heritage of Stirling as inspiration and resource for a Silver Arts Award. Silver Arts Award encourages young people to develop their artistic practice (any art form), delve further into the world of the arts in the locality and to work together on a leadership project. 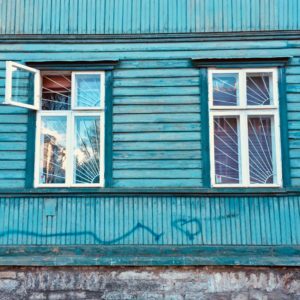 The group will have the opportunity to work with a range of artists and heritage experts including the outreach team at Scotland’s Urban Past and take part in a traditional arts workshop at the Engine Shed. Then, next April, the group’s leadership project will be to devise a creative virtual and/or physical heritage trail for other young people. This trail will involve arts activity, discovering artists and some way for those taking part to share what they have created/discovered. All young people who have completed the trail will receive a Discover Arts Award. Eagle-eyed viewers in Scotland who saw the recent three-part BBC series called “Growing Up in Scotland: A Century of Childhood” may have noticed Scran mentioned in the credits at the end of each episode. Combining still images, film footage and contemporary interviews, the three episodes were a nostalgic look at Scottish childhood, and we were delighted to be asked to supply many images for all three programmes, including one of our all-time favourites, the two Glasgow boys with Spacehoppers. While the standard Scran licence doesn’t allow commercial reuse of images, we’re happy to grant commercial licences on an ad-hoc basis, and anyone can do this by clicking on the “Buy” button underneath an image. 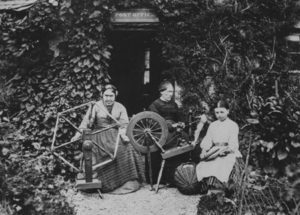 Scran regularly supplies images for commercial re-use to newspapers, magazines, book publishers and film and TV companies, and if you see a TV documentary about Scotland, take a close look at the credits at the end. 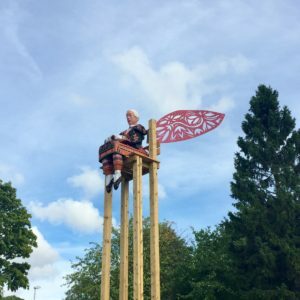 Some of you may have heard about the recent Scottish Heritage Angel Awards? Here at Scran we caught wind of the fascinating work of Mark Cranston, who proceeded to win Category A for Investigating & Recording his extensive collection of bricks. Scran has a pile of brick related content, which Mark was already familiar with, and through a series of fortunate events, we were able to contribute to his ever growing collection. East Lothian resident, Gina Williams, donated the brick which Scran then delivered to Jedburgh. The brick was from a Dunbar manufacturer and although he already had an example of a M.B. Sherriff brick, he had not seen this particular variation. One face on each has a shallow rectangular ‘frog’ or depression with text MB SHERRIFF/ DUNBAR and impressions of screw-heads. Seafield Brick & Tile Works at West barns, near Dunbar, supplied the local market as well as special commissions in Scotland and abroad. These bricks were made using deposits of surface clay; originally dark grey, the clay becomes red when fired, a change caused by the oxidation of iron contained in the clay. The Seafield brickworks operated from the early eighteen hundreds on land reclaimed from the sea between West Barns and Belhaven. 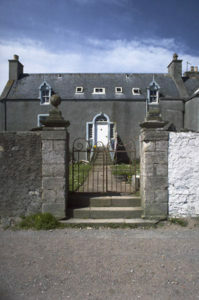 Once in the hands of David France, it passed to William Brodie and then his relatives, the Sherriffs of West Barns. William Brodie, invested in new equipment and expanded the works, exporting many of the products on his own fleet of steam vessels from Dunbar Harbour. Unusually for a Victorian industrialist, M.Brodie Sherriff was a woman. In 1884 she purchased & re-opened the brickworks at Westbank, in Portobello, so expanding the business further. Nineteenth century East Lothian had a number of industrial scale plants producing bricks, tiles, pipes and other large scale ceramics. Seafield relied upon surface deposits of clay. Later, the abandoned clay pits were used to dump municipal waste and landfill until around 1970. Then the land was landscaped and planted; part was reserved for amenity, being integrated into the John Muir Country Park in 1976.